A mysterious house harbors an unimaginable secret. . . . It’s wartime, and the Carver family decides to leave the capital where they live and move to a small coastal village where they’ve recently bought a home. But from the minute they cross the threshold, strange things begin to happen. In that mysterious house there still lurks the spirit of Jacob, the previous owners’ son, who died by drowning. With the help of their new friend Roland, Max and Alicia Carver begin to explore the suspicious circumstances of that death and discover the existence of a mysterious being called The Prince of Mist—a diabolical character who has returned from the shadows to collect on a debt from the past. Soon the three friends find themselves caught up in an adventure of sunken ships and an enchanted stone garden, which will change their lives forever. Shortly after I finished The Prisoner of Heaven I came across The Prince of Mist at Half Price Books. 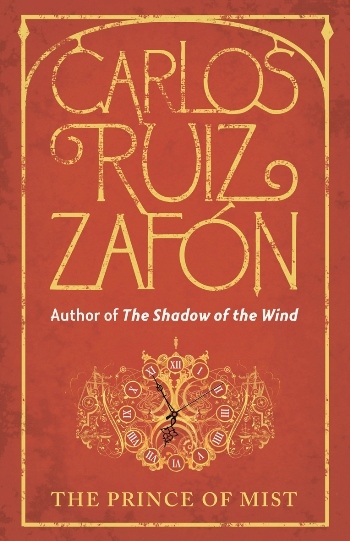 It's the first novel Zafon published and since I was still on a high from his latest, I snatched it up. The Prince of Mist is a young adult thriller and while it made for a quick, fun read I think I would have enjoyed it more if had I read it when I was younger. It felt a bit too juvenile for my taste. There were definitely parts of the short novel that creeped me out, and Zafon did a good job pulling me into the story from the start, but having read his adult novels, this one felt a little too basic and a little too transparent by comparison. 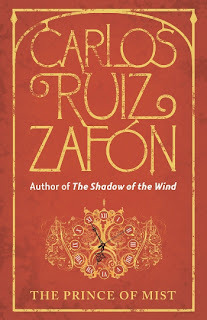 On the positive front, I will say that Zafon brought a strong sense of place to the forefront of the novel, just as he does in his adult works. The beach house, complete with a cemetery of stone figures, the sunken ship in the bay and the lighthouse overlooking the area made for an eerie and memorable landscape. He also included a few twists to keep it interesting. Plain and simple, this is a fun little read. I just prefer Zafon's adult stuff better. Recommended, to my 12-year-old self. This one didn't work for me. I adore Zafon, but I agree, this one doesn't hold up next to his adult books. I've had this on my list for a while because I've loved the other Zafons I've read. I didn't realize it's YA-- definitely something to remember if I ever find it at the library or bookstore. I had already decided to give this one a miss, your review has confirmed my thoughts.